Looking for personalised sports bag tags? 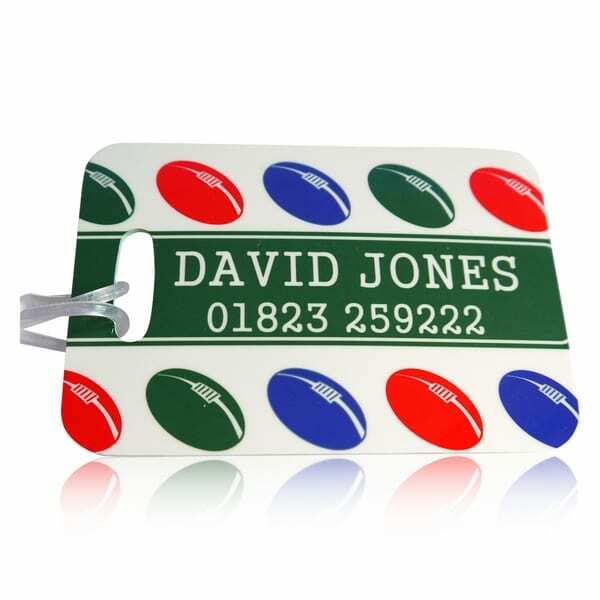 Our rugby bag tag is sure to be popular with rugby players and fans. Makes an excellent men's luggage tag for gift giving. Our solid rigid plastic bespoke luggage tags are 100% waterproof, printed on both sides and come supplied with a loop attachment for securing to all types of bags. Measuring 100 x 70 mm it is the ideal size for all bags. All our personalised sports bag tags have a superior high gloss finish, which ensure the tag is scratch resistant. Personalised sports bag tags are super practical and offer an easy solution as a luggage identifier. Could also be used on school bags, weekend bags and such like. The rectangular white tag features an array of red, green and blue rugby balls with your chosen name text printed in the middle solid green banner of the tag. Name will be printed in white text to ensure easy identification for all to see. We offer 2 lines of text. Some customers like to add a contact phone number or perhaps a school name or club. Whilst others prefer to use both lines for the name. The is especially useful for long names. Please do be aware that the longer the name the smaller the print will appear.